“Too often we underestimate the power of a touch, a smile, a kind word, a listening ear, an honest compliment, or the smallest act of caring, all of which have the potential to turn a life around.”—Leo Buscaglia, author. You, as the family caregiver, undoubtedly know the power that Leo Buscaglia is referring to. Your daily life is filled with those small yet powerful moments when you make your senior parent’s life better and more enjoyable on a daily basis. In the act of giving, you may not notice the subtle signs that warn you that your own mental, emotional or physical health may be on the decline. 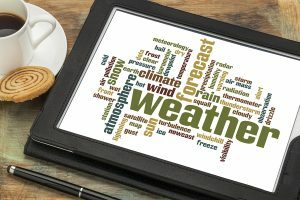 Here are some important clues to be aware of and the action to take when you notice these subtle changes creeping in. Problem: Exhaustion has a sneaky way of invading one’s life. It begins as a tired feeling when you wake up in the morning and concludes with the inability to remain alert throughout the day. It often leads to binge eating and drinking of caffeine at about 3 p.m. when energy levels are at their lowest, creating a vicious cycle that leads to lack of quality sleep and fatigue during the daytime. Solution: Replace caffeine with natural energy boosters and be sure to make getting a good night’s sleep one of your top priorities. Natural energy boosters include green tea, fruit and nuts. It may take some time for your body to adjust to the steady flow of energy as compared to the quick thrust and following downward spiral that follows the intake of sugar and caffeine, but it will be well worth the transitional period. To ensure a good night’s sleep, create a bedtime ritual that involves progressive relaxation. This may include a warm bath filled with a cup of sea salt and a few drops of your favorite essential oil, relaxing music, a good book and a cup of herbal tea. This is a great ritual to incorporate into your senior parent’s life as well. Avoid any stimulants late in the day, as well as alcohol. A daily exercise regime, even if only for 30 minutes, does wonders for a good night’s sleep. Problem: Too much to do and too little time to do it in is a common concern among caregivers. Add to that the everyday needs and tasks involved in your nuclear family and it’s no wonder that 55 percent of caregivers report feeling overwhelmed. Solution: Prioritize and time management are your two best friends when it comes to feeling in control of the daily tasks that need to be completed. Make a list and check it twice. This list includes the daily tasks and who is to fulfill them. If the only person on this list is you, it’s time to make a new one. Reach out to family, friends, community members and your parent’s neighbors. You’ll be surprised at how many people are happy to lend a hand. They may not have a whole day to offer, but they are more than happy to provide transportation, a shared meal or complete your parent’s grocery shopping at the same time they are doing their own. A senior care provider can assist with the daily tasks as well as provide transportation, run errands and accompany your parent on social outings, making sure they stay engaged while you take the time to recharge and refresh. If you or an aging loved one are considering Senior Care Services in Nassau County NY, please contact the caring staff at Gentle Hands Home Care. Her vision was fine. In fact, she often bragged about the fact that she’d missed the late-forty reading eyeglass prescription so many of her peers endured. Nevertheless, her daughter kept pestering her about making an appointment with her eye doctor. But really, with all the other physical ailments she was concerned with—the arthritis creeping into her fingers and back and the diabetes that had taken her favorite snacks away, who had time? Five years later, she almost hit a pedestrian walking across the street. She wasn’t even aware of him until he banged on her window. This time, she heeded her daughter’s strong suggestion that she go see an ophthalmologist. Two days later she was sitting in his office after completing a comprehensive eye exam when he told her she had glaucoma, and that it had already taken part of her peripheral vision away and would eventually steal the rest of her sight unless she started immediate treatment. Glaucoma is often referred to as the “sneak thief of sight.” There are few early warning signs and, once noticed, significant vision loss has occurred and is irreversible. Treatment consists of eye drops, pills, laser surgery, or traditional surgery. The aim is to control the pressure build-up in the eyes, which is putting pressure on and damaging the optic nerve. Surgery is usually a last option if medications are not keeping the eye pressure in check. There are several recent advancements in surgical techniques that are proving promising including the trabectome and canaloplasty. The Glaucoma Foundation is an excellent source of information for any new treatments on the horizon. 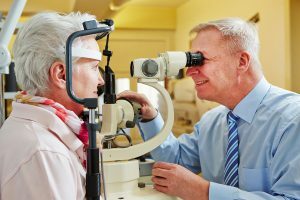 While medical treatment is vital in order to limit further damage to the eye and loss of vision, there are some lifestyle approaches your parent can take to help the cause. A diet high in anti-oxidant rich fruits and vegetables is recommended, particularly those with carotenoids such as orange and yellow peppers. Blueberries and cherries are good for the eyes as well as wild-caught salmon, high in omega-3 fatty acids. Specific supplements that Dr. Axe recommends are bilberry, astaxanthin, fish oil, CoQ10 and magnesium. As supplements can interact with prescription medicine, it is always best to check with your parent’s primary health care provider before adding supplements to their diet. Exercise improves the circulation and tends to lower the intraocular pressure. Aerobic exercise, in particular, has been shown to be beneficial. Aim for 30 minutes of brisk walking or other type of exercise such as stationary bicycling most days of the week. If your loved one needs assistance with the everyday activities of living, consider obtaining the services of a senior home care provider. In addition to daily tasks, they can provide transportation, accompany your parent on daily walks, and prepare eye-healthy meals that are then shared and enjoyed together. If you or an aging loved one are considering Home Care Services in Massapequa NY, please contact the caring staff at Gentle Hands Home Care. Too many caregivers find themselves feeling sick and run down the longer that they’re on their caregiving journey. If that’s the case for you, there may be some changes you need to make to get a little bit healthier. Busy caregivers often fall back on some poor eating habits because they’re trying to just keep going. If that describes you, it’s time to switch things up. Start doing meal prep weekly with whole fruits, vegetables, whole grains, and lean proteins. The more convenient the healthy food options are to grab and to eat on the run, the more likely you’ll be to reach for those than for something less healthy. Exercise works your muscles and it gets your blood flowing. It also helps you to sleep better at night, which can be a tremendous help when you’re a busy caregiver. You’ll also start to find that you’re gradually experiencing much more energy as you stick with your exercise plan. Find activities that you enjoy so you’ll stick with them. Isolating yourself isn’t healthy for you and it doesn’t leave you in a good position to be an effective caregiver. Reach out to friends and family with whom you’re close. Even if you’re sending text messages when you have a chance, that’s a start. You might also want to consider joining a support group in order to meet other caregivers who understand what you’re going through. It’s probably no big deal anymore to make appointments with your elderly loved one’s doctor and to take her to them, but when is the last time you went to your own doctor? If you’re trying to keep yourself healthier as a family caregiver, you need to make it a point to talk with your own doctor about your health. Everyone needs to take time away, including family caregivers. You can’t keep going without allowing yourself to have down time. Schedule it in and keep those appointments with yourself. If you need someone to stay with your loved one while you take time to rest, consider hiring home care services providers. You can schedule them for regular intervals, ensuring that you take the time that you need. Focus on caring for yourself and it will start to fit seamlessly in with your caregiving responsibilities. If you or an aging loved one are considering Home Care Services in Jamaica NY, please contact the caring staff at Gentle Hands Home Care. If you are the family caregiver for an aging loved one, you might be considering hiring some help. Homecare aides can be a blessing for a home with an aging senior, because they can help with many of the daily tasks that your loved one struggles with. They can help with getting dressed, bathing, using the restroom, and reminding your loved one to take their medications on time. What you might not know, though, is that homecare aides can be of more specific help as well. In addition to general care and assistance, they are also trained to help seniors suffering with chronic illnesses, such as asthma. While homecare aides are not certified to administer any medication on their own, they are capable of reminding your senior to take their medicines on time, and of helping with many other things. Reminding them to take medications – As mentioned above, one of the most important ways that a homecare aide can help a senior with asthma is to remind them to take any asthma medications they have been prescribed. These medications may be vital for your loved one, and having someone there to help them to remember to take them can be a great way to keep them in better health. Retrieving medications in an emergency – Oftentimes, one does not know they are going to have an asthma attack before they have one. If a senior is in the middle of an asthma attack, they may be incapable of moving through the house to go retrieve their inhaler. Their homecare aide, however, can act fast, and can get them the inhaler quickly, so that they can end the attack and recover more quickly. Assisting with exercise – Even if a senior has asthma, it is important that they still do a fair amount of physical exercise to keep their body healthy. You can research the best ways for your loved one to get regular exercise, and your loved one’s homecare aide can monitor and assist them while they work out. Household help – If simple things make it hard to breathe, chances are, you wouldn’t want to waste your breath cleaning your house, right? Homecare aides can help with tidying things up, allowing your loved one to rest and save their breath. They can also help with cooking and other household tasks that may be difficult for your loved one to do with asthma. Hiring a homecare aide can be a great idea for someone with asthma. With the help of a professional, your loved one may even be able to live on their own! A homecare aide can help them with nearly anything they need help with, and this will give you more peace of mind, since you know that someone is looking out for them, and helping them to live a more comfortable, relaxed life. If you or an aging loved one are considering Homecare Services in Bronx NY, please contact the caring staff at Gentle Hands Home Care. Your loved one has a variety of different needs that you’ll help her to meet during your caregiving journey. One that is very important is helping her to keep her emotional health and well-being positive. There are a lot of different aspects that feed into emotional health, so you’ll need to look at a variety of possible solutions. Home Health Care Brooklyn NY – How Can You Help Your Loved One Stay Emotionally Healthy? Your loved one’s doctor can help you to spot potential issues that can contribute to poor emotional health for your loved one. for instance, medication side effects or even vitamin deficiencies can be a potential issue. Working with your loved one’s doctor helps you to get to the root of potential causes much more quickly. While you’re at her doctor’s office, make sure that it’s safe for her to start an exercise plan. If your loved one is cleared for physical activity, start finding ways to exercise with your loved one. This can be as simple as taking a walk together in the morning before the weather warms up or doing some stretches together before bed. Often people can become sadder than they anticipate if they don’t have something to look forward to. If your loved one’s schedule consists mostly of doctor’s appointments and other obligations that aren’t very enjoyable, it’s time to add some other activities in there. Start scheduling events that your loved one might be able to look forward to and know that they will be enjoyable. If your loved one isn’t being as social as she used to be, that can take a toll on her emotional health. Start lining up some visits with friends, family members, and neighbors so that your loved one has some company. That’s not always possible, of course, and your loved one might need more company than that. That’s when hiring elderly home health care providers can come in handy to keep your loved one occupied and interested each day. Your loved one’s emotional health may ebb and flow depending on what she’s going through at any given time. Try to be understanding of any particularly difficult issues or times of year for her. If you or an aging loved one are considering Home Health Care Services in Brooklyn NY, please contact the caring staff at Gentle Hands Home Care. May 26th is National Heat Awareness Day. This is a good time to stop and look at your mom’s home. If she’s going to age in place, as her caregiver you need to take measures to make sure she’s not overheating on the hottest days of summer. Before your mom goes to bed, set up window fans in as many windows as possible and turn them on to bring in the cooler night air. Before the sun starts heating the house, make sure you trap that cooler air using the next step. When it’s hot out, shut doors and windows. Use light-blocking curtains to keep the sunlight from coming in and heating up the home. If your mom doesn’t have curtains, hanging sheets or towels will help. Fill a bowl with ice and place it in front of a fan. When you turn on the fan, the melting ice will help cool the breeze. If your mom has space in the freezer, you can fill a metal bowl and place it right in the freezer to create one large block of ice. Your mom can stay comfortable using an air conditioner. You will need to invest in an energy-efficient model, but they’re not as expensive as they once were. These air conditioners have built-in thermostats that turn the unit on and off to keep the room at a set temperature. You can also save money by shutting off rooms your mom doesn’t use. Many of today’s appliances give off decent amounts of heat. The TV is one appliance you’ve probably noticed gives off a lot of warmth. A computer is another. On the hottest days, skip TV or computer use and read books or play board games instead. You also don’t want to turn on the oven. Stick to sandwiches, salads, or grilled fare. Hire a team of caregivers to check on your mom when you can’t be there. A caregiver service can help you get the right team together at a schedule that makes sure your mom is well looked after. Don’t worry about her independence being taken from her. Caregivers are there to help and offer companionship. With a home care service, your mom can age at home safely and have someone there to make sure your mom doesn’t overheat. If you or an aging loved one are considering Caregiver Services in Long Island NY, please contact the caring staff at Gentle Hands Home Care. Are You Worried About Your Elderly Loved One Driving a Car? You aren’t alone if you are wondering whether your aging loved one should still be driving. After all, seniors often struggle with the demands of driving as they age. Instead of confronting your elderly loved one about their driving abilities, you can take several steps to either reassure yourself that they are still capable of driving or whether they need to stop driving permanently. Elderly Care Manhattan NY Are You Worried About Your Elderly Loved One Driving a Car? The best way to do a personal observation is to take a ride with your elderly loved one to see how they do. As you are watching, take note of their ability to operate the vehicle safely. Be aware of whether they are practicing safe driving habits and are aware of their place on the road. Watch for any physical conditions that may be limiting their ability to safely drive, such as poor vision, inability to turn the neck and head, or reduced reaction times. Another place to get objective information about whether your elderly loved one should still be driving is from their doctor. While a doctor won’t be able to disclose private health information to you without permission, you could volunteer to accompany your aging loved one to a physical exam. You should ask specifically about any physical limitations they may have that could affect driving. Also, inquire about medications your loved one may be taking that could interfere with their ability to safely operate a vehicle. In many states, elderly drivers are required to renew their license in person after taking a few tests designed to evaluate ability. Seniors may be asked to take a vision test confirming their eyesight is adequate. Sometimes they will be asked to take a driving performance evaluation so the motor vehicle department can verify they still have the ability to take on the responsibilities of the road. If the examiner feels that they are not practicing safe driving, they will suspend or not renew the senior’s driver’s license. If they feel the senior is still capable of driving, they will issue the license right away. With all this information, you’ll be able to figure out whether your aging loved one truly should be driving or whether it’s time to make alternative transportation arrangements. If the senior is no longer able to drive, it’s critical that they still have access to all the stores, activities and social events they love. One way to ensure seniors have the transportation they need is to hire a senior care agency to provide basic services for seniors, such as cleaning, small chores, cooking and driving. You can work with senior care aides to set up a schedule of where your loved one needs to be and when. Other options include driving services and arranging rides with friends and family members. Instead of worrying whether or not your elderly loved one should be driving a car, take steps to observe and evaluate their abilities. If doctors and driving examiners support your own suspicions, you can take the next step and set up a senior care plan that won’t leave your loved one isolated and stranded when they can no longer drive. If you or an aging loved one are considering Elderly Care Services in Manhattan NY, please contact the caring staff at Gentle Hands Home Care. Is Your Aging Parent at Risk for Suffering a Stroke? May is National Stroke Awareness Month. As a family caregiver this is the ideal opportunity for you to learn more about this condition and how it can impact your parent’s life as they age in place. Understanding this condition enables you to give your elderly loved one the level of care that they need to properly handle their condition and maintain their quality of life throughout their later years. This starts with recognizing the risk factors that your parent may have that might increase the chances that they will suffer this type of medical emergency. 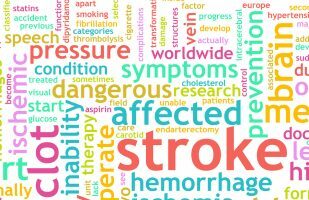 Home Care Hicksville NY – Is Your Aging Parent at Risk for Suffering a Stroke? If your aging parent has any of these risk factors or you are concerned about their risk, do not hesitate to get in touch with their doctor to discuss their health. The doctor can tell you about your parent’s personal risk and what you can do to help them reduce that risk. They can also better prepare you for the type of care that your aging loved one will need in the event that they do experience such a medical emergency during their later years, including helping you to know how to properly respond if you notice the early warning signs of a stroke. 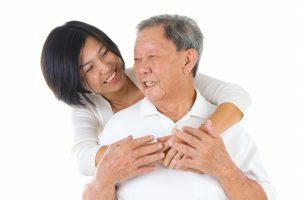 Starting home care for your aging parent can be an exceptional way for you to help your parent achieve and maintain a higher quality of life as they age in place. A home care services provider can be with your aging loved one on a schedule that is right for your them, ensuring that they get all of the care, support, and assistance that they need while also making sure that you remain at the forefront of their care routine. 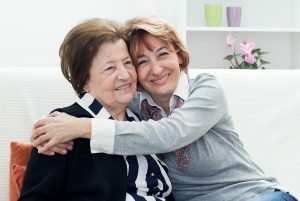 This means that they are able to give your loved one a personalized set of services tailored to their individual needs, challenges, and limitations to help them manage these in the way that is right for them while also encouraging them to maintain as much independence, activity, and engagement as possible. If you or an aging loved one are considering Home Care Services in Hicksville NY, please contact the caring staff at Gentle Hands Home Care. Just like other organs that don’t function as well with age, the skin isn’t resilient as it once was. Aging loved ones are more susceptible to skin irritations and problems than when they were younger. The good news is that with regular habits to promote healthy skin, seniors can reduce the risk of skin issues. However, as seniors age, they may not be in a position to attend to their skin care needs as well as they should. That’s where home care sevices and family caregivers can step in and make sure they are doing everything they need to avoid high risk practices and do what they need to in order to keep the skin nourished and healthy. Aging skin has a difficult time retaining moisture, so seniors are especially prone to dry skin. Dry air, lack of hydration and even as a result of certain conditions like diabetes can also trigger dry skin. When seniors struggle with dry skin, they often scratch it so hard that they break the skin. Not only does this look unsightly, it opens the door to wounds and infections. To help reduce the itching and discomfort, seniors can drink plenty of water, use light lotions and turn on a humidifier if needed. From skin tags to cancerous growths, aging skin is subject to a range of things that could be serious but usually aren’t. Brown age spots are common on the hands, arms and face but pose no health issues. Flesh-colored skin tags may cause irritation but are also not harmful. All unusual growths should be reported to a doctor to make sure that skin cancer is not present. Home care services should be instructed to watch for unusual growths as they perform hygiene and grooming tasks with their elderly clients. From scratches that break the skin to pressure sensitive ulcers, wounds take longer to heal in the elderly. Of course, this gives bacteria and viruses a much better chance to cause infections in their bodies. For those in frail health or that are recovering from surgery, infected wounds can cause a lot of additional health problems. Open wounds can also cause pain, frustration, stress and more in seniors. Along with open wounds, seniors might also suffer with prolonged bruising, which could take quite a bit longer to heal and may signify a serious issue internally. Seniors can suffer from a number of skin conditions that can affect the appearance of the skin and cause pain, stinging or itchiness. Common skin conditions include psoriasis, dermatitis, pruritus, herpes zoster, xerosis and purpua, just to name a few. Seniors can also develop skin cancer, even if it has been years since they’ve spend a lot of time in the sun. From benign to serious, each of these conditions need to be treated by a doctor. Healthy skin in seniors can make a real difference in how they combat illness, withstand infections and enjoy their day-to-day life. With a little coordination between home care services and family members, seniors can reduce the risk of common skin conditions. If you or an aging loved one are considering Home Care Services in Little Neck NY, please contact the caring staff at Gentle Hands Home Care. Mobility issues can arise in the elderly for numerous reasons. From a loss of balance as a result of medications or a disease process, or due to injuries, loss of muscle tone, or chronic conditions such as arthritis. Loss of mobility can lead to loss of independence and an encroaching sense of isolation. Helping your parent to remain as active and independent for as long as possible is one of the greatest gifts you can offer them. To the elderly, the progression to the use of a walker can symbolize further decline, one more aspect of life that age has laid its mark on. They see people using walkers or canes and say to themselves, “That’s not for me.” Rarely do humans see themselves as others see them. Though the body is 80, their mind may be just rounding their 60th year and the image of a stooped over elderly person pushing a walker does not enter the realm of their own self-image. If they are hesitant to take your advice, consider making an appointment with their physical therapist or primary health care provider. They can come from a position of authority and probably have several stories they could share regarding the consequences of people that chose not to use a mobility device and paid the consequence. 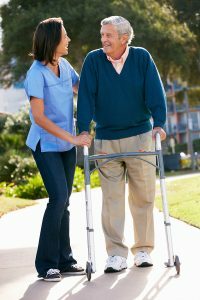 Walkers can keep your parent’s independence longer by providing a tool to allow them to continue to remain mobile despite possible physical limitations. Not becoming one of the statistics: Ninety-five percent of hip fractures are the result of falls. One-quarter of Americans over the age of 64 fall every year. Increasing sense of empowerment allows them to partake in activities and social events they may have previously stayed away from due to mobility issues. According to a CDC study, between the years of 2001 and 2006, 47,000 seniors were treated in emergency rooms due to the improper use of canes and walkers. Mobility devices need to be fitted by a professional to ensure they are the correct height and weight and the appropriate model for your parent’s use. Some will be able to use walkers with wheels while others will not. A physical therapist will be able to show them the proper use techniques including walking and getting up or down from a seated position, giving them the greatest chance for success. A home health care provider can assist your loved one with the daily activities of living while still helping them retain as much independence as possible. This type of care is called interactive—they provide assistance while still letting your parent do what they can within the framework of what is safe for them considering their physical and sometimes mental restrictions. If you or an aging loved one are considering Home Health Care Services in Nassau County NY, please contact the caring staff at Gentle Hands Home Care.